In case there was any shred of doubt left that I am not a hopeless restaurant spod, I should tell you I sometimes spend "down time" looking at menus. Not always for places I'm due to visit (in fact not even usually places I'm due to visit - I like to be surprised, or at least not disappointed that something I've set my heart on isn't available when I get there) but for multi-starred gastro-palaces in Paris or the south of France, where punters happily shell out €140 for a starter and the descriptions of the dishes sound like a cross between a haiku and a bad trip ('Lake Geneva trout, lake and forest blend, spruce seasoning and white butter sauce (without butter)'. In the course of my virtual travels I've seen many extraordinary menus and marvelled at some truly astonishing prices, but nowhere has made my jaw hit the floor faster than an ostensibly modest bar on the Grand Canal in Venice, serving a range of familiar Italian trattoria dishes and a few cocktails. It's not just that the prices at Harry's Bar in Venice are high. It's a tourist town, you'd expect a bit of a premium. It's that the prices are so ludicrously inflated past all sense of reason and decency it's almost like they don't want you to eat there at all. 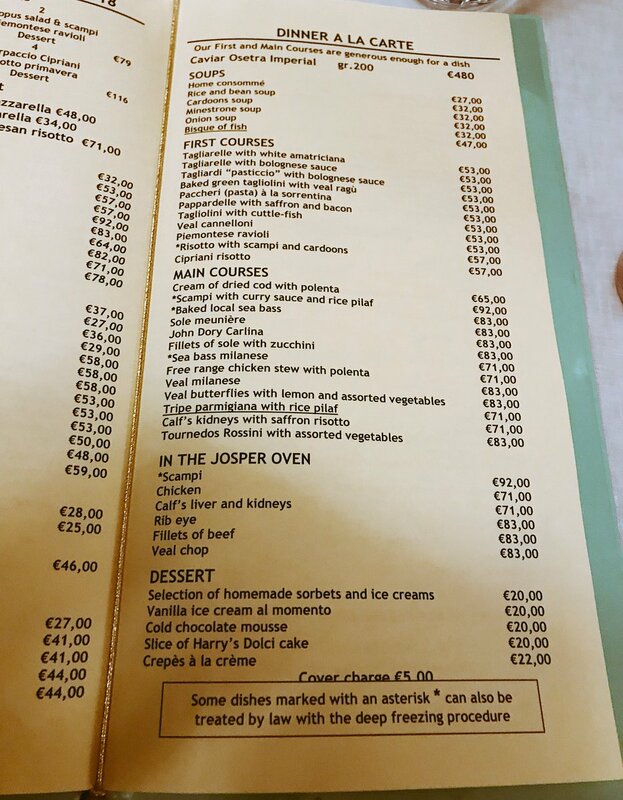 Here's a snapshot @samphiresalsify took in February; tagliarelle with bolognese sauce for €53; Calf's kidneys with saffron risotto for €71; €92 - NINETY TWO EUROS - for scampi which the restaurant proudly declares are probably frozen. 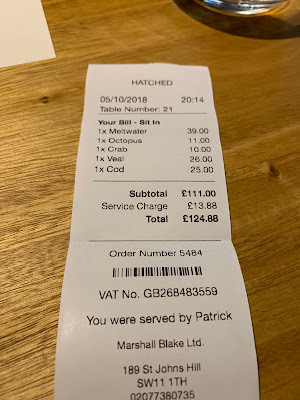 Oh, and naturally you pay 10% tax, 12.5% service and a €5 cover charge on top of all this, in case you were worried €92 for some scampi was just a little too affordable. Now I don't know what the food is like at Harry's Bar Venice - fairly ordinary by all accounts - but it is a pleasure, not to mention a relief, to report that in Harry's Bar London (no relation, weirdly), newly nestled in amongst a fairly grim selection of tourist cafés and chicken shops on James Street in Marylebone, the food is of a generally high quality and the prices are not only Not Ridiculous but in a couple of cases a genuine bargain. Take this basket of nduja bread, for example - basically an entire pizza sliced up, it costs a teensy £4.95 (plus service, but no tax or cover charge) and could easily make a pretty decent lunch for one. Zédel Brasserie, eat your heart out. From the 'antipasti' section though it was time to push the boat out a bit. "Harry's Tagliolini" is a decadent merging of truffle, parmesan and cream (oh my! ), baked in a little copper pan and flamboyantly slopped onto a plate tableside before being showered in more grated parmesan. With no one element overwhelming another, and with just the right amount of black truffle (which is to say, an absolute shitload), this was a belter of a dish, and although £12.50 is quite a lot, with all that truffle it still felt like value. We were hardly about to settle for just the one pasta dish though, so next up was this heaving pile of pappardelle al ragú Bolognese which certainly contained plenty of slow-cooked beef even if it could all done with a bit more depth of flavour. Weirdly I don't think salt would have helped here - the ragú itself was just a bit watery and underpowered - but there was still lots to like about the pasta itself and I did polish it off. Better, in fact much better, in fact very good indeed was the vongole, a gloriously buttery affair containing loads of fresh, plump clams and pasta so slippery and elastic it was almost alive. Lots of pasta restaurants in London attempt vongole. Not many of them are any good. This was. We were steered towards ordering the veal parmesan not just, it has to be said, by the staff at Harry's Bar, but also friends on Twitter who considered it a highlight of the secondi. And it's probably not anyone's fault, not least the supremely attentive and personable staff at Harry's Bar, that I'm not a huge fan of veal and probably should have stuck to my guns and gone for the truffled chicken as planned. Anyway, the point is, I didn't like it much - veal is a weird, bland meat and coating it in breadcrumbs and deep-frying it just served to highlight its weird, greasy blandness. Not even a very nice tomato dressing could spark much of interest. Still, at least I'll know for next time. Desserts started off quite normally and pleasantly. Profiteroles had been given the extra zshuzhing of being piped full of milk gelato instead of the usual cream, which was a very nice touch, and the chocolate sauce draped over the top had a lovely glossy finish. Perhaps the extra effort gone into topping each pastry with gold leaf would have been better spent making the pastry itself lighter and a bit less chewy, but this was still a very decent sweet, and well worth anyone's time. The other dessert was a toadstool. To say it felt a little out of place on what had otherwise been a solidly familiar Italian bistro menu is somewhat of an understatement; it was like sitting down to a meal of mixed grill and tinda masala at Tayyabs and then for dessert being presented with kulfi and bread pudding fashioned into the shape of an enormous pink flamingo. Not unimpressive, not necessarily unwelcome, just very, very weird. Anyway, the toadstool (frozen ricotta, white chocolate and I think some sort of basil sauce) just about lived up to the theatrical visuals, though to be honest I'm not sure whether the ricotta needed more sugar or I'm just put off toadstools for life after reading Stormy Daniels' book. This was an invite, so we didn't see a bill, but I think with a Bellini, a bottle of nice Barbera and a glass of Tuscan dessert wine I think it would have come to something like £70/head - not exactly cheap but completely acceptable for central London and for service and surroundings like these. Oh yes, the room - you're in the mood to enjoy yourself the moment you step into Harry's Bar; the sensitively-lit tables, dark wood panelling, low ceiling and etched mirrors create a cosseted, clandestine atmosphere, with the noise levels pitched expertly at just loud enough to prevent you from overhearing other people's conversations. It's almost as if the guys who launched the Ivy, Scott's and J Sheekey knew something about how to design a restaurant. Shocking, really. So yes, another hit for Caprice Holdings and judging by the throngs packed inside and out last night (there are some tables outside perched genuinely distressingly close to the idling minicabs on James Street but I suppose are better than nothing) it's going to do very well indeed. Increasingly it seems as I get older I find things like sparkling service and lovely clubby surroundings can distract from minor off-notes with the food, though no doubt this time next week I'll be back to moaning about places that spend all their money on soft furnishings and have nothing left over for chefs. And what do I know anyway? Just go to Harry's Bar, snuggle into a corner table, order a bottle of red and a plate of pasta. You'll love it. In fact, go crazy - have a toadstool. It seems I'm not the only one that's been waiting - with an expectation bordering on feverish - for Kym's, the new restaurant from restaurateur-chef Andrew Wong. During the course of dinner there last week I lost count of the number of people trying their luck as a walk-in. Again and again, every few seconds, for the whole two hours or so we were there, various groups of rather well dressed people (this is the City after all) would approach the front desk, look longingly around the room, and then be sent dejectedly back out into the rainy London streets, tail between their legs. It was enough to make someone who had secured his booking a few days before the inevitable slew of 5 star reviews quite pleased with himself (that would be me, then) - sometimes it pays to be a restaurant obsessive. So Kym's is the hottest ticket in town, but this was always likely to be the case. A Wong in Victoria is many people's favourite Chinese restaurant, pretty much the only good reason to travel to that part of town if you don't have tickets to see Wicked, but in that functional (albeit friendly) little space, the food did the talking. In Bloomberg Arcade, Wong's team have installed themselves in one of those flashy split-level City spaces typical of these kinds of new builds, a grand central staircase circling a huge fake sakura tree and various attractively spotlit tables, so here there's even more to get excited about. The food could even take a bit of a back seat, and the place would still be rammed. Of course, there's no sign of the food being anything less than as exquisitely thoughtful and well-rendered as in Victoria, so you can relax on that front as well. But first, a citrus cocktail involving a pleasing buzz of sichuan peppercorns, which glowed wonderfully under the house lights. Sorry to bang on about the lighting so much - it really won't be that much of an issue for most diners, but if you're taking photos of your food it really makes a difference. I mean just look at these pork skewers. See how the light plays on their delicately-chargrilled flesh. See the interplay of highlights and shadow. See the inviting bowl of sweet peanut dip floating just out of focus. Oh and yes, they tasted great, too. Silken tofu is exactly the kind of thing I want to eat when I go to a restaurant like this, something so far removed from your standard Chinese offering that it was still a topic of conversation an hour after we'd paid up and left. No description I could offer could do it justice, but try and imagine neat little cubes of the finest tofu - "silken" really is the perfect adjective - in a complex mix of sesame seeds, crispy shallots and spring onions, all bathed in rich dark soy. This was so good - so fantastically good - that we ordered spoons to scoop out every last bit of the sauce that was left at the bottom of the bowl. Kym's style themselves as a "roasting" concept restaurant, so it was a delightful surprise that the first vegetarian dish impressed as much as this. A spring roll was very good - I particularly liked the flourish of the delicate extra rice cracker casing on the outside. If I'm being brutally honest, even the country's finest spring roll can only, in the end, be a spring roll, but I've no doubt this had just as much care and effort lavished on it as everything else on the menu. "Three treasure" is a selection of three different roast meats - chicken, pork belly and Iberico char sui - and is another example of how Andrew Wong can lift already an even pretty complex set of techniques performed on premium products to another level. If you've had better Chinese roast chicken than this anywhere - gently soy-marinated thigh with a skin of golden, melting perfection - well I need to know about it, because I have a new obsession. Similarly, pork belly had the most impossibly delicate puffed skin, just thick enough to crunch but not chewy, with a bright-white and bouncy flesh, and Iberico char sui was glazed with- well, I can't even begin to guess, possibly honey, possibly spiced sugar, but enough to make you want to order the whole thing again as soon as it was over. We didn't do that, though, because we had this to eat next - chicken chop, breadcrumbed and fried in the Taiwanese style, cleverly done and not too thick or greasy, with an interesting mix of deep-fried and fresh herbs on top. You get the strong impression that even with the more straightforward items - the spring roll, the chicken chop - that these are the absolute best they can be, and that any vague sense of disappointment from not enjoying a tender fried piece of breadcrumbed chicken breast is entirely the fault of the diner, not the restaurant. French beans would probably have been better enjoyed as a side with the previous courses rather than munched through on their own as we mentally prepared ourselves for dessert. Though perfection is a word that can easily be used to described much of the food, I'm afraid the service was a rather frustrating mixture of completely absent and rather scatty - lamb buns appeared without having been ordered (we even corrected them when they repeated our order at the start of the meal; fat lot of good it seemed to do) and it took about half an hour (!) to be asked if we'd even wanted a drink at the start of the meal. The food was so good this was all almost forgiven, but it's enough to bring the score down a bit. ...and this is glazed summer berries and a sharp, smooth berry sorbet, sat in a fluffy white chocolate mousse. And it didn't even cost all that much. £66 a head with a bottle of wine and a cocktail each is a desperately reasonable amount of money to spend for food of this standard and in this part of town, and so even with reservations about service, my recommendation of the place is hardly much qualified. In fact, it's no exaggeration to say I want to go immediately back and try all the other menu items that I've seen whizzing past my Instagram feed over the last couple of weeks. Whether I'll get a chance, well that depends on whether interest in the place remains merely "feverish" or rises to "Sushi Tetsu". But you know what, I'm going to have a damn good try. You know when you go to a new restaurant within easy walk of your own front door, run by enthusiastic and friendly people, serving a short, attractive menu of seasonal British dishes and you hope with every fibre of your being that it turns out to be good? Hatched (previously, and very briefly called Darwin though don't ask me why it's changed; maybe because there's another restaurant in town called Darwin and they got wind) is, on paper, everything you'd want from a local bistro. Bright and spacious and well-appointed, all it needed to do was serve a half-decent, value-for-money dinner and I'd be something approaching a regular. A decent restaurant in SW11! Finally. So why did I leave on Friday evening with the very strong impression that Hatched wasn't for me? Well it wasn't for want of trying, from either party. I did desperately want to enjoy the place, and from the warm welcome up until the first bits of food arrived, everything was going swimmingly. I can't remember what occupied the site previously, but you get the impression a lot of money has been spent on giving it clean, Nordic lines and a smart open kitchen, very much home amongst the coffee shops and interior design studios on St John's Hill. Of course, intelligent interior design and nice lighting shouldn't mean everything, they just project a certain confidence in the product on offer, and as anyone will tell you, confidence is attractive. Unfortunately, there's nothing particularly confident, or intelligent, or attractive, about charging £10 for a bowl of courgetti and cherry tomatoes. OK, so there were trace amounts of white crab meat in here aswell, but it was hardly in abundance, and this bowl, piled clumsily high and lacking in texture, finesse, interest of any kind, more closely resembled something you'd find in a plastic tub at M&S rather than a £10 starter in a Modern British restaurant. Octopus was better, if that doesn't sound too much like damning with faint praise (it does, doesn't it). The animal itself had been sensitively treated, a nice soft texture in the larger sections and nicely crisped-up tentacles, with a gentle aroma of smoke. But there was something weirdly sweet about the glaze that had been used on it, which the "red pepper chutney" struggled to balance. My friend's veal was the best of the mains. Much like the crab starter, it wasn't about to win any prizes for presentation (I mean does that look like a £26 plate of food to you, or yesterday's leftovers?) but the veal had loads of flavour and was timed well, and the accompanying veg were nice enough even if they looked like they'd been thrown onto the plate from a distance. Cod was certainly a generous amount, the flesh beautifully white and collapsing into strong, defined flakes so they clearly know how to cook a bit of fish, even if I'd have liked a bit more crunch from the skin. At least they left the skin on though - far too many places just give up and remove it, which I always think is a bit disappointing. But the brown shrimp it came with were vinegary and distracting - pickled almost - and a couple of bits of roast fennel did not do much to persuade that this plate of food was worth £25. Also, and I could be wrong, but I'm pretty sure the same sauce finished both the cod and veal dishes. Which is as weird as it is lazy. We didn't stay for dessert. 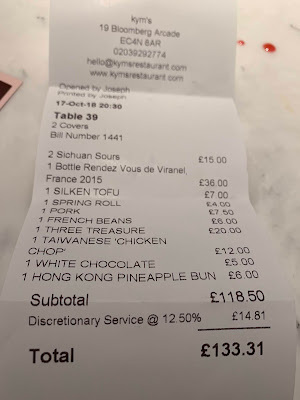 Perhaps we didn't quite need to spend £39 on a single bottle of wine, but with no introductory fizz or cocktails, no nibbles, not even a tray of house bread either (which seems particularly mean), the bill came to a painful £62.44/head. At literally half that, it still would have been a faintly disappointing dinner but it would have at least stood a chance of tempting me back at some point in the future. But I'm entitled to expect far better for this kind of money - this is approaching the Chez Bruce price point, a short walk away and far more deserving of your time and cash.